Basilica Cathedral of the Assumption (the Leon Cathedral) built in 1814 it is the largest in all of Central America and is on the countries 500 Cordoba note. Though it has been several days since we were in Nicaragua I have been saving this post for Christmas. 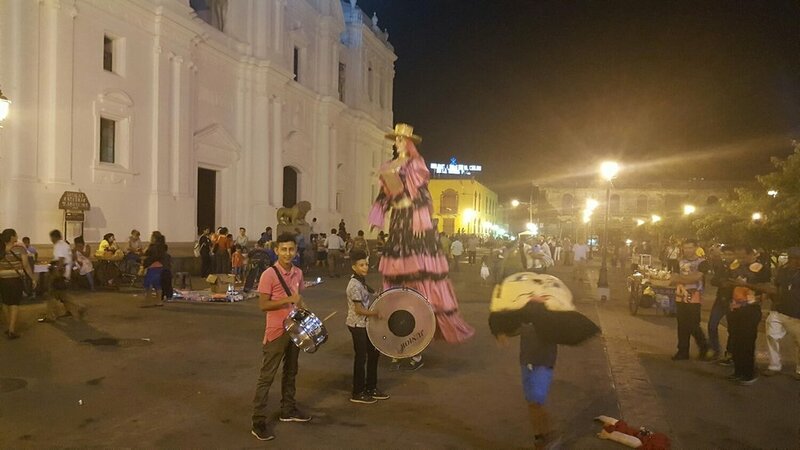 Throughout Nicaragua in December you can see kids and teenagers acting out the story of La Gigantona. We stumbled on to this phenomenon accidentally. Walking through the streets of León near the main square in front of the León Cathedral we were suddenly inundated with sounds and activity. Loud detuned drums greeted our ears, brilliant flourishes of colors danced in the street ahead of us, as kids in puppet costumes danced to the rhythm. The two costumes consist of "La Gigantona" , and "El Enano Cabezo". The celebration represents the blending of the Spanish and indigenous native cultures (of course with some catholicism mixed in there). La Gigantona is a tall Spanish woman the costume is 2 to 3 times the height of the kids wearing it (easily close to 12 feet). El Enano Cabezo represents the short intelligent native complete with a huge head. La Gigantona and El Enano Cabezo, complete with drums and story teller. La Gigantona swings her arms and twirls her dress to the rhythm while the El Enano bobs his cabeza like a real life bobble head dancing around Gigantona's feet. A third kid bangs a hollow thumping rhythm on whatever drum they have (I've seen bass, and tenor). A fourth kid recites poetry or folklore over the drumming. Apparently this act is similar to caroling in the US and elsewhere, they move from door to door dancing and reciting Nicaraguan folk stories for small tips. Busy Christmas market, in front of the ever inescapable McDonald's. On the night we were in León, the celebration was concentrated in the center of town set against the lit Leon Cathedral, in the midst of a Christmas market. A nativity scene competition flanked all sides of the street. The bustle and activity made it feel like a scene out of a spy movie, where the protagonist disappears in the crowd eluding the evil spies in pursuit. Despite the feeling I never did spot James Bond.